Monument Signs are ideal for street side identification and are most often used at the main entrance of a business. Let Ottawa Custom Signs work with you to determine the most appropriate and cost effective solution in terms of size, shape and fabrication. Since they are large and easily visible at a distance, they broadcast your company logo and message to all passers-by. They are suited for businesses like commercial plaza malls where tenants are moving in and out since the name spaces can be changeable. 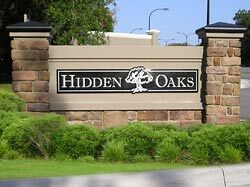 Monument Signs also offer an up-scale entrance welcome at resorts, condominiums and developments. To make an enquiry about Monument Signs please contact us now. To order a Monument Sign now please click here.